I’m excited to announce the public preview of Azure AD Domain Services in the new Azure portal. You can now create new managed AD domains and perform administrative tasks like configuring secure LDAP using the Azure portal. If you follow the blog, you already know that Azure AD Domain Services is pretty cool. It provides managed domain services like domain join, group policy, LDAP, and Kerberos/NTLM authentication, all fully compatible with Windows Server Active Directory. What might surprise you is that over 8000 (!!) customers are already using Azure AD Domain Services today! And qith this new public preview, we’ve made it even easier to create a managed AD domain using our brand-new wizard experience. The wizard knits tasks like creating virtual networks, configuring group membership of the delegated administrator group, and enabling domain services into a simple, intuitive, step-by-step experience. If Azure AD Domain Services is not enabled for your Azure directory – Create a new managed domain using the new Azure portal. If you’ve already enabled Azure AD Domain Services for your Azure directory – Contact us via email to migrate your existing managed AD domain to the new Azure portal. From there, you can administer your existing managed AD domain using the new Azure portal. Note: This public preview release supports only classic Azure virtual networks. We don’t support Resource Manager-based virtual networks yet, but the team is hard at work making that happen and we hope to preview it soon! As always, your feedback is very important to us! Please share your comments, questions, or concerns on our discussion forum, send us an email at aaddsfb@microsoft.com, or simply comment below. Apple has relaunched the My Support website with an all-new design featuring bolder headings and adaptive layout to match the look of the rest of Apple.com. Available through the new address at mysupport.apple.com, the overhauled site has all the same features like the old one, which debuted back in 2011. 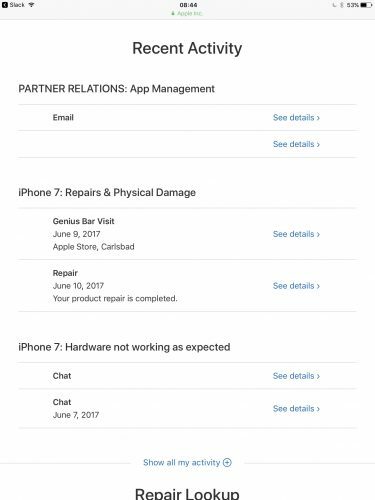 Upon logging in with your Apple ID, you can register your Apple product by typing in a serial number, which lets you access various support options and do things like track repairs, check on a device’s warranty status and much more. You can give products nicknames, reorder them, sort them by device category or coverage status and more. Other options include the ability to browse your repairs within the past 90 days, look up a repair by entering your Repair ID or a product’s serial number and so forth. Some of the features of the old site are nowhere to be found on its redesigned counterpart. That’s because some of them have been relocated elsewhere or integrated into the redesigned Apple ID or Apple Support webpages, like the ability to edit your contact information. While the old site let you add an AppleCare protection plan to hardware, that features is absent on the new site because, as of recently, all of Apple’s AppleCare plans for Macs, iPads and iPhones must be bought alongside a new device or within 60 days of purchase and they’re automatically registered to your Apple ID. The site provides a Contact Us link that leads to Apple’s webpage where you can find various support options that are available to you, based on your country and products. 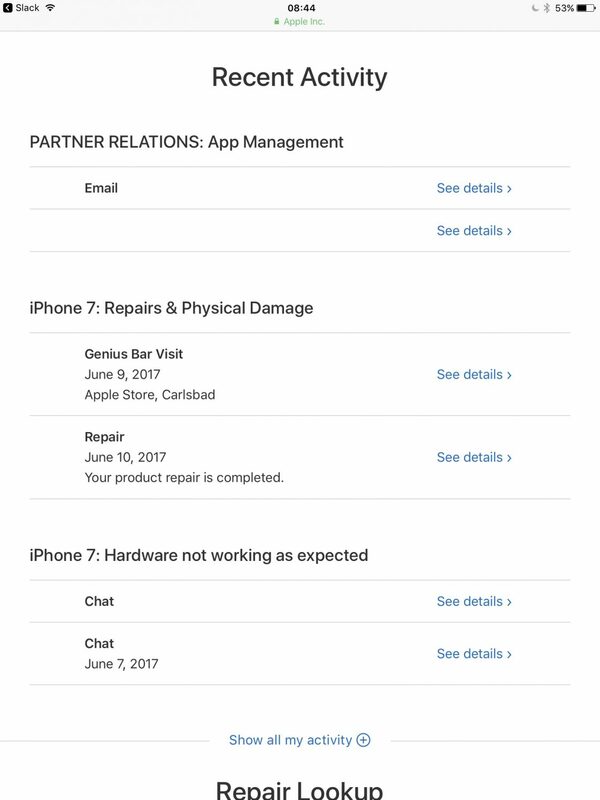 Like before, you can see a history of your support interactions and AppleCare coverage eligibility, access product manuals, guides, technical specifications and support pages for your products, view previous replacements of products and more. Many people were unaware that this site existed in the first place because finding it without remembering the URL was impossible. I remember having to Google “where can I find all my registered Apple products” just to get to that page. 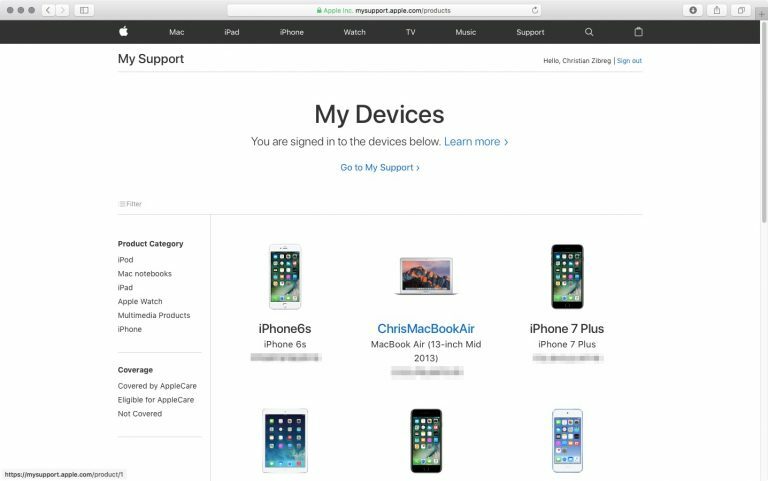 Even though the Apple ID site shows all your devices, older hardware with no iCloud support isn’t displayed there. 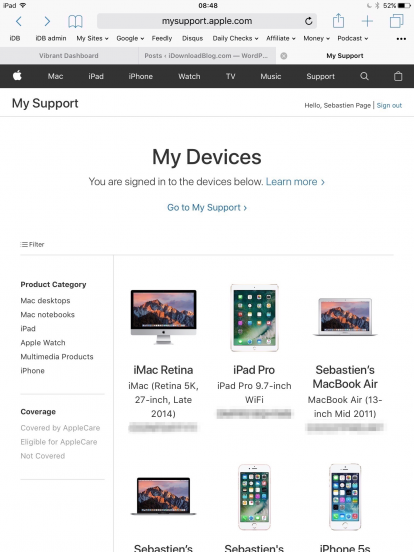 At the revamped My Support site, you can easily find all your Apple products, including all your iCloud-authorized devices and any manually registered products. Hey Siri, control my HomeKit-enabled coffee maker! Apple has opened up the HomeKit Accessory Protocol Specification to all developers! What’s the “HomeKit Accessory Protocol Specification”? It’s the means by which connected home accessories communicate with Apple devices via HomeKit. In other words, you can make your own HomeKit-enabled accessories and control them with Siri and the Home app for iOS. Up until now, only companies who intended to distribute their HomeKit-enabled accessories commercially could make use of Apple’s HomeKit Accessory Protocol Specification. Developers had to request licensing through Apple’s MFi program and go through reportedly rigorous testing to claim the coveted Works with Apple HomeKit badge. Now if you want to create HomeKit-enabled accessories for non-commercial purposes (if you’re a hobbyist or consider yourself a “Maker,” for example) you can! Here’s how you get the ball rolling. When prompted, sign in with your Apple ID and password. Click Continue to license agreement. Read the limited license agreement and check the box to confirm you’ve read it. Click Download to download the HAP Specification. The HAP Specification is a 256-page PDF filled with all the necessary information about creating HomeKit-enabled accessories that can communicate with Apple devices. There are certain requirements your accessory must meet in order to make use of the HomeKit framework, but they aren’t as rigorous as the requirements for commercial HomeKit accessories. Apple says commercial accessories have to have the Apple Authentication Coprocessor, must adhere to the Bluetooth core specification or obtain Wi-Fi Alliance certification, and must be certified under Apple’s MFi Program. Non-commercial HomeKit accessories won’t be able to tout the Works with Apple HomeKit badge. Anyone adding a non-commercial HomeKit accessory to their HomeKit setup will see a prompt indicating it’s not certified to work with HomeKit, but the prompt is nothing more than an alert — you’ll still be able to add the accessory. Once you’ve read through the HAP Spec and know you can create a device that adheres to all the necessary specifications, it’s time to get crackin’! 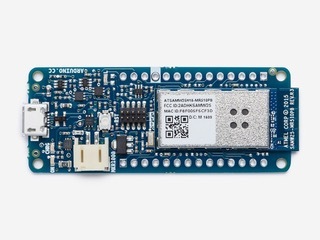 As Victor Ilyukevich‏ pointed out over on Twitter, that means buying or setting up an accessory using an Arduino and controlling it with Apple HomeKit. You could use it to create any number of HomeKit-enabled accessories so long as they follow the HAP Spec. Once you’ve got your idea figured out, your limited license agreement signed, your HAP Spec read, and your Arduino (or other communication accessory) set up, you’ll just want to make sure your device is adhering to the HAP spec and can communicate with Apple HomeKit. Everything you need to know can be found in the HAP Specification, which you can download by following along with these steps. What do you think? Excited that anyone can create their own HomeKit-enabled accessories and control them using the Home app for iOS and Siri? I know I am! I’m going to attempt to dive into the HAP Specification and see if I can’t get my own HomeKit-enabled accessory rollin’ (dog treat delivery device, anyone?). I’ll be taking notes along the way so be sure to check back in the future for a potential in-depth how to! Er du irriteret over at macOS’s indbyggede stavekontrol konstant markerer et ord som havende en stavefejl selvom du er sikker på at du har stavet korrekt? Det kunne eksempelvis være firmanavne. Fortvivl ikke, for det er meget nemt at tilføje nye ord til stavekontrollen, så de fremover ikke bliver markeret som forkerte. Typisk markeres stavefejl ved at macOS sætter en rød linje under ordet, hvilket selvfølgelig er en stor hjælp, men også kan byde på frustration hvis ordet faktisk er korrekt stavet. Nedenstående fremgangsmåde handler om macOS’s indbyggede stavekontrol. Programmer deres benytter deres egen stavekontrol, som eksempelvis Word, vil ikke få gavn af denne metode. Det vil til gengæld alle de andre programmer, der benytter systemets integrerede stavekontrol. 1. Når du skriver i et dokument, en mail etc og ser et ord, der er fejlmarkeret som stavefejl, skal du højreklikke på det. Du kan også holde ctrl-tasten nede og lave et almindeligt klik. 2. I den menu der kommer op skal du trykke på “Husk stavemåde”. Nu er ordet føjet til stavekontrollens positivliste, så du fremover kan skrive det uden at få markeret det som havende en stavefejl. 1. Skriv ordet og højreklik på det. 2. Vælg “Husk ikke stavemåde” i den menu, der kommer frem. Så er ordet fjernet fra positivlisten og bliver igen markeret som fejlstavet, hvis du skriver det. Kan en Mac se ud som på billedet øverst? Ja, det kan den faktisk godt. Man kalder det en Hackintosh – en hjemmebygget Mac. Jeg har været Mac-bruger i snart 20 år og har haft adskillige Mac-computere gennem tiden. Både stationære og bærbare. Generelt har jeg været meget tilfreds med kvaliteten og valuta for pengene. Nogle gange mere end andre, men Apple har altid leveret varen. Alligevel har jeg gennem årene interesseret fulgt med i det uofficielle Mac-miljø og de folk der bygger deres egen Mac. Det man kalder en Hackintosh. En Hackintosh er en gør det selv-computer der kan køre Apples styresystem, macOS. At bygge sin egen computer er en helt normal ting for Windows-brugere. Enhver teenageknægt har vel efterhånden prøvet at købe hardware og bygge sin egen Windows-PC. Men når det gælder macOS er det noget anderledes. Styrken ved Apples computere er at software og hardware er designet til at spille 100% sammen, så ydelsen altid er i top og der ikke opstår underlige problemer med kompatibiliteten. Det giver til gengæld også en del udfordringer, hvis man vil gøre det selv. Apple tillader nemlig i princippet ikke at man installerer og afvikler macOS på andet hardware end Apples egen. macOS er ganske enkelt ikke lavet til at understøtte andet end Apples egen hardware. Det er her det uofficielle Hackintosh-miljø kommer ind i billedet. For via små hacks, tweaks og ninjatricks kan det nemlig alligevel lade sig gøre at installere macOS på en selvbygget Mac. Det er netop dette scenarie, jeg vil komme ind på i denne artikel og i flere efterfølgende artikler, hvor jeg går mere i detaljer. Ikke at jeg som sådan vil opfordre folk til at gå uden om Apples egne computere, men fordi der kan være situationer, hvor det giver god mening at bygge sin egen Mac. Min egen indgangsvinkel til projekter er at min søn, der ellers har en iMac, gerne ville have en Windows-computer til at spille på. Det skurrer selvfølgelig lidt i mine ører, men da spil ikke er Mac’ens aller stærkeste side, forstår jeg ham godt. Og når der så alligevel skulle en PC ind i huset, kunne vi lige så godt sørge for at den kunne afvikle macOS, så sønnike trods alt fik et fornuftigt alternativ, når der ikke spilles. Den gamle iMac kan vi så bruge til noget andet. Inden jeg begynder at gå i detaljer, hvilket vil ske i den næste artikel i serien, vil jeg komme ind på fordelene og ulemperne ved at gøre det selv og bygge sin egen Mac. Hvorfor skal du overhovedet gå i gang? Hvem er det for og hvad koster det? Den åbenlyse fordel ved at bygge sin egen Mac er, at du har fuld kontrol over hvad du får. Du bestemmer selv om det skal være discount eller pro-grej i topklassen. Om du vil have 4GB eller 32GB RAM og hvilken processor og grafikkort du vil bruge. Du kan prioritere dine midler som du vil. Måske vil du spare på lagerpladsen og satse på god grafik. Måske vil du have en lynhurtig processor og Terrabyte-vis af lagerplads. Det er helt op til dig. Du kan bygge en computer der er 100% målrettet dine behov og de krav du har. Den anden store fordel er at du kan opgradere efterhånden. I Apples egne Mac’s kan du ikke opgradere hardwaren. Det kan du i din egen. Du kan udskifte samtlige dele i din egen Mac efterhånden som behovet opstår, økonomien tillader det eller udviklingen kræver det. Du kan med andre ord holde din computer up to date i længere tid uden behov for at skifte hele computeren. Den sidste store fordel ved at bygge sin egen Mac er at det er sjovt. Alle ved at en fuglehus man selv har bygget giver en særlig følelse og stolthed – i virkeligheden uanset hvor skævt det er og hvor meget fuglene flyver udenom. Den følelse bliver mangedoblet, når du sidder ved en computer du selv har samlet. I mit tilfælde har det også givet anledning til at sønnike har lært hvad de forskellige dele i en computer kan og hvordan det hele hænger sammen. Som en form for uddannelsesprojekt har det været alle pengene værd. Mange vil sikkert tænke på prisen som en fordel også. Det er det ikke nødvendigvis – det har i hvert fald ikke været min indgangsvinkel. Jo, det er typisk billigere, men det skyldes oftest at man kan vælge dele af en lavere kvalitet eller undlade dele, man ikke bruger. Vil have have 100% samme specifikationer og kvalitet som Apple bruger er der ikke den store besparelse at hente. 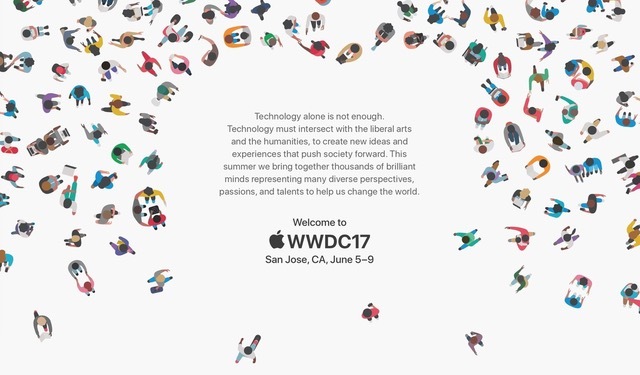 Den største ulempe er at man må sige farvel til Apples lækre design. Du kan ganske enkelt ikke lave din egen iMac. Vi er mere ovre i afdeling for klassiske skrumler i en større eller mindre kasse og en løs skærm. Det behøver ikke være noget problem, og foretrækker du en klassisk computer, er det måske ligefrem en fordel. Du bestemmer i hvert fald selv formfaktoren, farve etc. En kreation der kan sammenlignes med hvad Jonathan Ive kan præstere får du dog næppe. Den anden store ulempe er at det hele er uofficielt. Apple vil ikke hjælpe dig med at få tingene til at virke. Der kan og vil opstå problemer. Når det er sagt, skal man heller ikke gøre det værre end det er. Ved at vælge de rette dele og tænke sig lidt om, er det muligt at få en selvbygget Mac, der virker upåklageligt i 99,9% af tiden. Du skal dog være klar over muligheden for, at det ikke er alt der forløber totalt gnidningsfrit. Der skal arbejdes lidt for sagen. Hvem skal bygge en Hackintosh? Et Hackintosh-projekt er ikke for folk, der bare vil have en computer der virker ud af kassen. Har du ikke en hvis portion viden, eller mod på at få det, skal du stoppe her. En selvbygget Mac tager mere tid og viden at få op at køre. Det er langt fra uoverstigeligt, men gider du ikke rode med hardware og software, så er en Hackintosh selvfølgelig ikke noget for dig. Køb trygt en af Apples færdige computere og vær sikker på at du får det ypperste Apple kan levere. Er du derimod nysgerrig og kan du godt lide at rode med tingene selv, så kast dig ud i projektet. Det er både lærerigt og sjovt. Og kikser det fuldstændigt, så kan du altid installere Windows eller Linux på maskinen. Jeg har allerede været lidt inde på det. Prisen er du sev herre over. Du kan derfor bygge en Hackintosh til nogle få tusinde kroner eller du kan spendere 25.000 kroner på projektet. Det handler udelukkende om, hvad du har brug for. Den Hackintosh jeg har bygget, kostede i runde tal 8.000 kroner inklusive skærm, men det vil jeg komme mere ind på i den næste artikel, hvor jeg vil skive om hvilken hardware du skal vælge. Jeg kunne sagtens have brugt det dobbelte, da jeg er gået lidt på kompromis nogle steder for at holde prisen nede. Omvendt kunne jeg også have sparet nogle tusinde, hvis det havde handlet om det. Det korte af det lange er, at du i det store hele kan bygge dig en Mac uanset hvilket budget du har, omend du selvfølgelig får hvad du betaler for. Nu er du allerede lidt klædt på til at bygge din egen Mac. Du ved nu hvad det er og kender lidt til fordele og ulemper. I den næste artikel vil jeg komme ind på valg af hardwaren. Selvom jeg skrev ovenfor at der er frit valg, er det nemlig ikke helt rigtigt. I princippet er det, men ved at vælge hardwaren med åbne øjne og på en kvalificeret baggrund, kan du undgå rigtig mange potentielle problemer. Noget hardware fungerer ganske enkelt bedre med macOS end anden hardware. Alt det må du dog vente med at læse mere om til artikel nummer 2 er klar i næste uge. 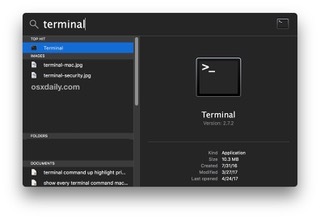 Did you know the Mac has a native SSH client built directly into the command line? This ssh client allows for secured connections and remote logins into other machines. 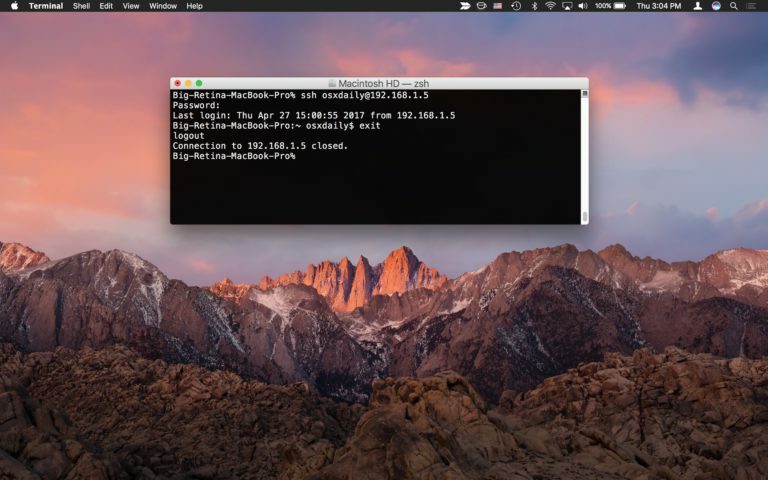 Unlike Windows, you won’t need a third party app to utilize SSH for connections into remote computers and devices, because ssh is built directly into Mac OS and Mac OS X – perfect! Let’s walk through how to make an SSH connection into another computer using the native ssh client in Mac OS. Some quick background for the unfamiliar; SSH stands for Secure SHell, and it permits making encrypted connections into other computers over a network or the broader internet. You can use the SSH client in Mac OS to connect to any other machine with an SSH server running, whether it’s on another Mac with Mac OS X, linux, unix, or Windows computer does not matter, as long as it has an SSH server running it and you have credentials, it can be connected to securely. That’s it, now you’re logged in to the remote machine via SSH. At this point you have access to any command line functionality on the remote computer, assuming you have privileges to perform the task or execute the command. What you do once you’re connected with SSH is up to you, but as state earlier it’s intended for advanced uses like systems administration, server management, network operations, and other higher level tasks that are generally less relevant to the average computer user. When you’re finished you can type “exit” to disconnect from the remote machine, or just close the Terminal app to close the ssh client and connection. * Side note: you can also SSH into your own Mac this way if you juts want to try this out, but there is little point to that since launching Terminal in and of itself grants you direct shell access to the computer to begin with. But, it does offer a means of experimenting with SSH connections if you have never done so before, just use your username @ localhost or 127.0.0.1 for the IP. By the way if you want to allow someone else to remotely SSH into YOUR Mac, you’d need to setup the native SSH server on your Mac (easy as described here) and then you’d want to add a new user account to the Mac for that person, never share your own login and password with anyone else. Keep in mind if you give someone SSH access to your Mac with an admin account, you are giving them full access to your computer, all files, apps, activity, logs, and everything else, representing complete and total remote access to the computer. The command line has a huge number of commands available and is more powerful than the familiar graphical interface (GUI) we all know and love, so you probably do not want to allow for this randomly. Anything you can do at the command line can be done through ssh, assuming appropriate user privileges – this is why it’s so widely used for systems administration and by advanced users, and much less relevant to neophytes and the less technically inclined. If you want to give someone remote access for troubleshooting purposes and you’re a novice, a better approach is to use screen sharing instead. Want to see more SSH tips (here)? Do have any fancy SSH tricks you want to share? Do you know of a better SSH client than OpenSSH that is built into Mac OS? Let us know in the comments! Er du træt af at bestemte personer kontakter dig? I så fald kan du blokere deres opkald og beskeder, så du slipper for at høre mere til dem. iOS indeholder nemlig en funktion, så man kan blokere uønskede telefonnumre. Dette gælder både opkald og beskeder. En rigtig smart funktion. Brug metoden til at afvise opkald fra folk du ikke ønsker skal forstyre dig eller som du bare har besluttet ikke ønsker skal kunne kontakte dig. 1. Åbn Telefon-appen og tryk på “Kontakter” eller “Seneste” nederst. 3. Find den kontakt eller det nummer du vil blokere og tryk på den. 4. Scroll hele vejen ned og vælg “Bloker”. Herefter vil du ikke længere modtage opkald eller beskeder fra vedkommende på telefonen. Du skal dog være opmærksom på, at opkald ikke bliver afvist helt, men bliver sendt til din telefonsvarer, hvis du har sådan en slået til. Vedkommende der bliver blokeret, vil ikke vide at han eller hun er blevet blokeret og vedkommende vil stadig kunne indtaste en besked på din telefonsvarer. Det kan man desværre ikke ændre på. Du ophæver blokeringen ved at trykke på “Fjern blokering” i punkt 4 ovenfor. Listen over blokerede kontakter kan også administreres fra Indstillinger > Beskeder > Blokeret. Hvis du hæver blokeringen, vil du ikke få eftersendt de beskeder og opkald der har været blokeret. De er væk for altid. Du skal altså ikke være bange for pludselig at stå med alle de beskeder du ville være fri for i første omgang. Du har med andre ord fuld kontrol over om du vil blokere uønskede personer på din iPhone. Det er dog desværre ikke muligt at lave en generel blokering af folk der ringer fra “ukendt nummer”. Kun opkald med tilkendegivelse af nummer kan blokeres. Tippet er ajourført i maj 2017. 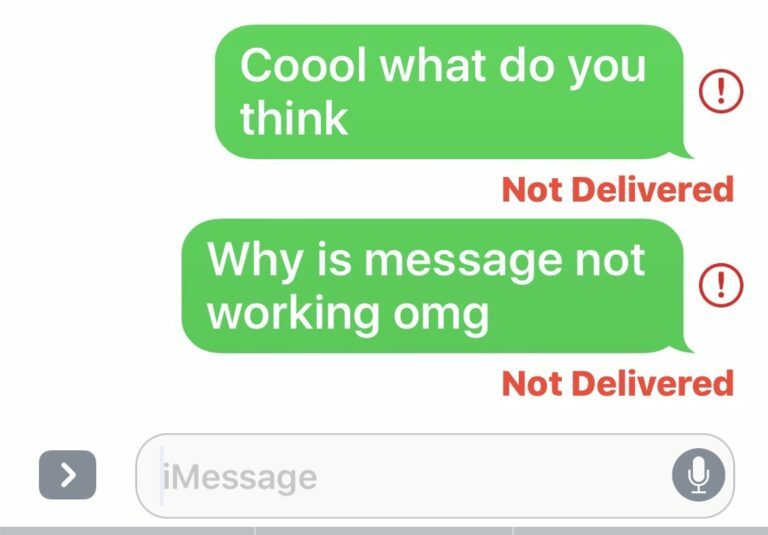 Messages sent from an iPhone or iPad may occasionally fail to send, instead displaying a “Not Delivered” error message along with a little red ! exclamation point next to the failed message. While this may be annoying, you can easily resend a message from iOS Messages app with minimal effort. You can resend an iMessage or a text message that has the “Not Delivered” error message easily. Before you attempt to resend the message be sure you have a cellular connection, as without a cell connection or data service the message will not be able to send. We’re demonstrating resending a message on an iPhone but this applies the same to iPad and iOS in general. 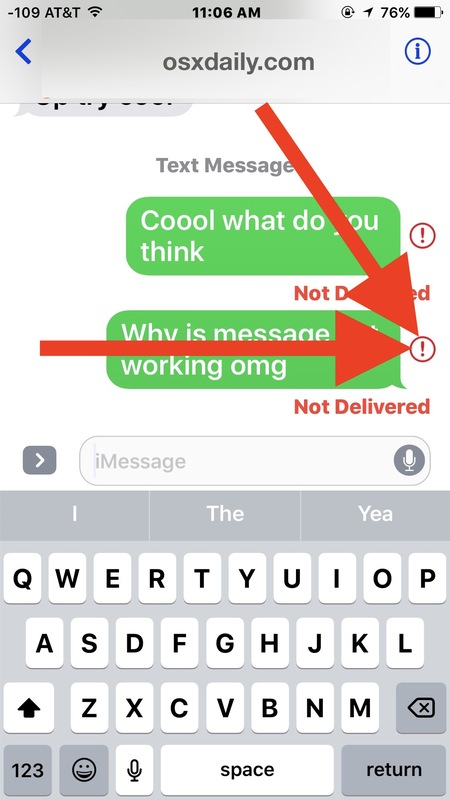 If the iMessage has been successfully re-sent you will see the typical blue bubble and a “Delivered” message, indicating that iMessage was able to resend the message. 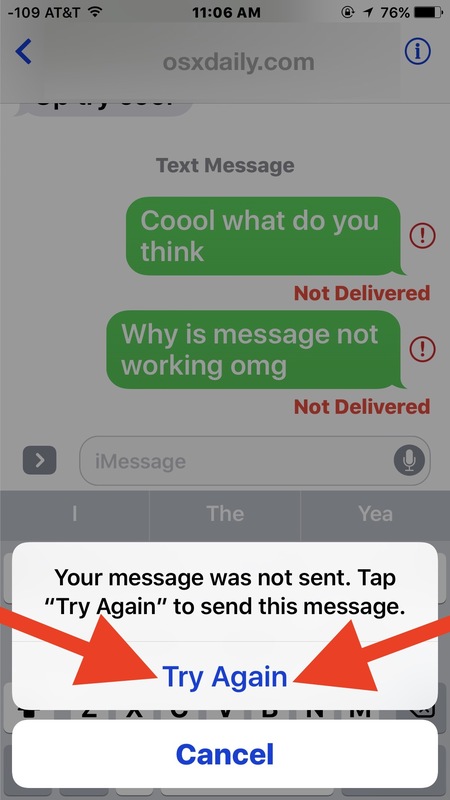 Keep in mind that iMessages can fail to send for multiple reasons, and you may see the “Not Delivered” message due to an interruption in your internet service, and interruption in the recipients internet service, or even if iCloud and related Apple online services are down. 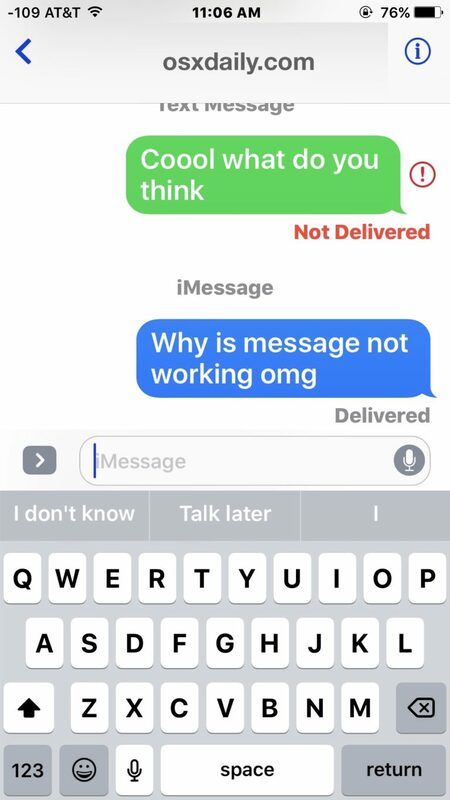 Additionally, if you lost cell service, or switched on AirPlane mode immediately after sending a message it may also show the Not Delivered error, which is actually an intentional trick to cancel sending a message from the iPhone that works quite well. Another option is to send again as a text message instead via SMS protocol, which can be helpful if the recipient is out of data range and therefore iMessage functionality but could otherwise receive a text message. If resending via iCloud fails and the traditional SMS also fails, you’ll likely want to troubleshoot why an iPhone is not sending text messages. The “Not Delivered” error can appear on an iPhone, iPad, an iPod touch, and even Mac OS as well, which is also able to resend a message from the Mac too if need be. Have any other tricks for resending messages from iOS? Let us know in the comments. Time Machine er Apple løsning til backup af ens Mac. Den er indbygget som en del af macOS og derfor uhyggelig nem at bruge. Det hele kontrolleres fra Systemindstillinger > Time Machine. En af de smarte ting ved Time Machine er, at man ikke hele tiden overskriver sikkerhedskopien med de nyeste filer, men har mulighed for at gå tilbage i tiden og finde præcis den udgave af ens fil, man ønsker. Deraf også navnet. Typisk til Time Machine være koblet til Apples Time Capsule, men behøver ikke være det. Time Capsules er et stykke hardware, der kombinerer en trådløs router og en harddisk til at lagre sine sikkerhedskopier på. Man kan dog vælge at bruge en ekstern disk efter eget valg, hvis ikke man har en Time Capsule. Vi har samlet nogle små tips, så du kan få endnu mere ud af Time Machine. Selvom Time Machine er en automatisk funktion, kan du også benytte den til manuel sikkerhedskopiering. Alt du skal gøre at at trykke på Time Machine-ikonet i topmenuen (det ligner et analogt ur) og vælge “Sikkerhedskopier nu”. Dette forudsætter selvfølgelig at du på forhånd har valgt en disk, som sikkerhedskopien skal lagres på. Dette gøres under Systemindstillinger. Time Machine behøver ikke være alt eller intet. Som standard er det alt, men under Systemindstillinger > Time Machine > Indstillinger, kan du tilføje filer eller mapper du vil udelukke fra sikkerhedskopieringen. Normalt er det ikke smart at udelukke ting fra sin backup, men har du eksempelvis nogle store videofiler eller andet, som ikke er kritiske, og vil spare plads, kan du udelukke dem fra Time Machine. Det kunne også være andre ting, du ikke behøver backup af. Måske fordi du har backup af tingene et andet sted. For at gendanne en fil via Time Machine skal du trykke på Time Machie-ikonet i topmenuen og vælge “Start Time Machine”. Herefter vil du se en masse Finder-vinduer, der ligger i en lang række. Det forreste vindue repræsenterer filsystemet som det er lige nu på Mac’en. De bagvedliggende vinduer repræsenterer de forskellige sikkerhedskopier bagud i tid. Via Finder-vinduet kan du finde lige præcis den fil, du gerne vil – også via søgefunktionen. Start med at finde filen og gå først derefter tilbage i tiden for at finde den ønskede udgave. Når du har fundet den fil du vil gendanne skal du trykke på den og vælge “Gendan”. Dette genskaber filen på det sted, hvor den var oprindeligt. Vil du gendanne den et andet sted skal du højreklikke og vælge “Gendan til”. Er din harddisk gået i stykker kan du boote computeren fra din Time Machine-sikkerhedskopi. Sluk computeren og tænd den igen mens du umiddelbart derefter trykker på alt-tasten (også kaldet option) og holder den nede. Nu får du mulighed for at vælge at boote fra din Time Machine-sikkerhedskopi. Da sikkerhedskopien ligger som pakkede filer er hastigheden noget nedsat, men det er en god metode i en nødsituation, hvor du står og mangler en vigtig fil. Du kan gendanne en ny eller nyformateret harddisk fra en Time Machine-kopi ved at boote Mac’en i Recovery mode. Sluk Mac’en og tænd den mens du holder cmd+r nede. I Recovery mode går du til Hjælpeprogrammer og vælger “Gendan system fra backup”. Herefter skal du vælge dit backup-drev og den kopi du vil gendanne fra. Via Time Machine kan du overføre alle dine filer fra en computer til en ny. Følg opsætningsproceduren på den nye Mac indtil du får muligheden for at rendanne fra Time Machine. Tilslut din Time Machine-enhed til den nye computer og følg instruktionerne. Læs eventuelt vores anmeldelse af Time Capsule her. Artiklen er ajourført i februar 2016.